A light hearted marketing initiative from the New England Patriots backfired when an automated system posted an offensive tweet to the team's 1 million followers at 9pm last night. 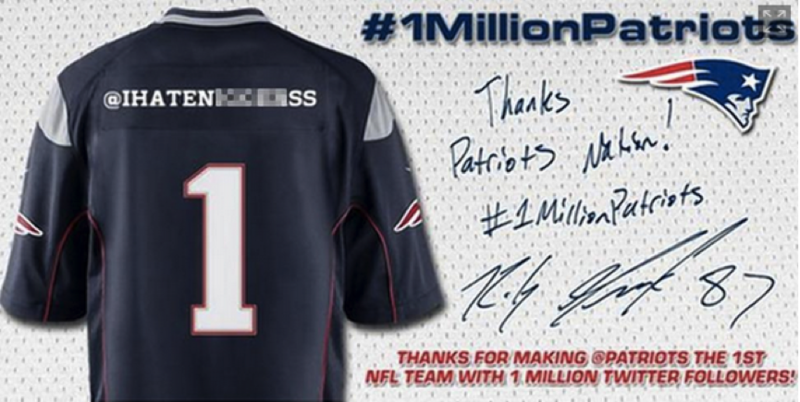 The offensive tweet said: "Thanks for helping us become the first NFL team with 1 million followers!#1MillionPatriots" but included an image of a team jersey with the follower's Twitter handle emblazoned across it - nice idea, but this particular handle was an offensive comment featuring the N word. An apology followed at 3.30am but by then the image had gone viral and gained even more exposure from articles across global news outlets. If the Patriots' marketing team had had a team of people reviewing this exercise overnight it wouldn't have happened, or at least the impact would have been minimized. If they had known faster they could have deleted the offensive tweet before it gained so much exposure. Our team of people would have detected the problem - and the reaction to it - and made sure the digital and PR team were aware straight away so they could work to minimize the impact. We could even have reviewed and escalated the auto-tweet within minutes before or after it was posted depending on the service they'd requested. The social media team might have been reviewing their promotion, but probably not every minute, overnight. Crisp's team review a brand's content 24/7 so it wouldn't matter what time the reward had been triggered, we'd have identified the problem and woken someone up if necessary.